This species is almost legendarily problematic. 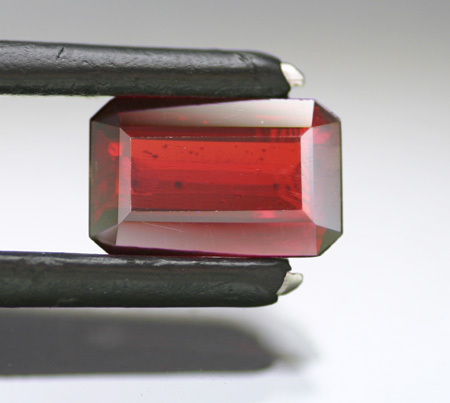 Despite the wonderful deep red color that these often have, they are almost always moderately to heavily included; typically by internal fractures that disrupt any potential brilliance quite noticeably. 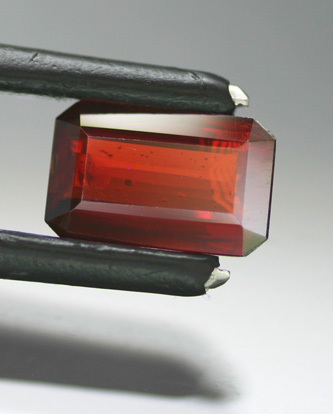 In fact, never before have we seen such a large gem with such an exceptional clarity. Cut to a perfect depth for these, the stone is not at all dark but is a bright and gorgeous red accentuated with a fine metallic luster. There is just one of the classic cleavage planes we can see when the stone is rotated and direct lighting is applied - see the second photo above; it actually looks great as it indicates Manganotantalite with just a visual inspection. Beyond rare in this size and quality ands simply beautiful.